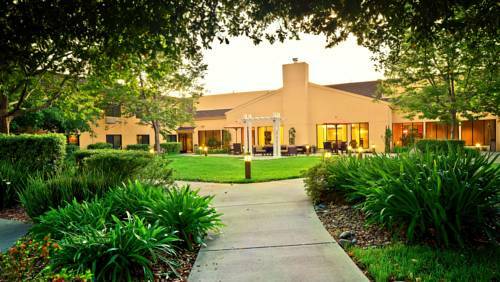 It's a new stay at Courtyard Vacaville by Marriott, a premier Vacaville, CA, hotel. Stay and experience our newly renovated "sleek, modern, functional" answer to travel in our CYnergy guest room. We're refreshing your travel experience providing a high-tech lobby that fuses style and greater functionality for the ultimate in convenience and innovation. Our hotel's warm and inviting atmosphere will make you feel welcome the moment you enter. Relax in our outdoor pool and spa and enjoy plush guest room amenities. The Bistro offers breakfast and dinner options as well as a fully-stock evening bar. his modern hotel offers a prime location for convenient day trips between Sacramento, Napa Valley Wine Country, Sonoma Raceway and greater San Francisco Bay area. Shop all day at the Vacaville Premium Outlets, or enjoy some of Vacaville's local attractions and hot spots. Spend a day exploring the newly restored Nut Tree-California's Legendary Road Stop or the Jelly Belly Factory.